Why do you need breakdown cover? Motoring just gets more and more expensive, so it’s not unreasonable for us to try and cut the cost of driving when we can. You might try and reduce your motoring cost in many ways but whatever you do, don’t avoid taking out breakdown insurance. Driving with breakdown cover gives you the confidence of knowing if your car does break down, professional help is a phone call away. What if your car breaks down! If the car does break down just remember it won’t be thinking how awkward it might be for you. Your car could break down and leave you stranded in extreme weather, miles from home with a car load of unhappy passengers or worse still you may be alone. At times like this you will be pleased you did get breakdown cover. Breakdown cover isn’t expensive, not when you think of the relatively high costs of insurance and petrol. But having the proper breakdown cover could make your life so much easier if your car breaks down. When choosing breakdown cover check out the RAC or AA. These are the UK’s largest breakdown service providers and between them attend more than 6 million roadside assistance call-outs each year. They both use branded vehicles that inspire extra confidence and security when you are stranded and need help. Personal or vehicle-based breakdown cover? Personal cover; this will cover you as the driver or passenger in any vehicle. Vehicle-based cover will cover your car no matter who is driving. Your car will be fixed at the roadside as long as you are over a ¼ away from home. Included is a 10-mile tow to a destination of your choice, local garage or a place of safety if your car cannot be fixed at the roadside. Cover on your driveway or within ¼ mile from home; you can usually book a time for the car to be fixed. Labour is free but the cost of replacement parts are not. If unable to repair your car at your home, it will be towed to the nearest garage. National Recovery gets your car, you and your passengers to any single UK mainland destination or back home after a breakdown and the car is not fixed at the roadside. Onward Travel this will vary between breakdown cover providers, but could include public transport, car hire or hotel accommodation if your car needs to go to the garage. European Cover If your car has a mechanical breakdown, it will be fixed at the roadside or towed to a local garage for repair. 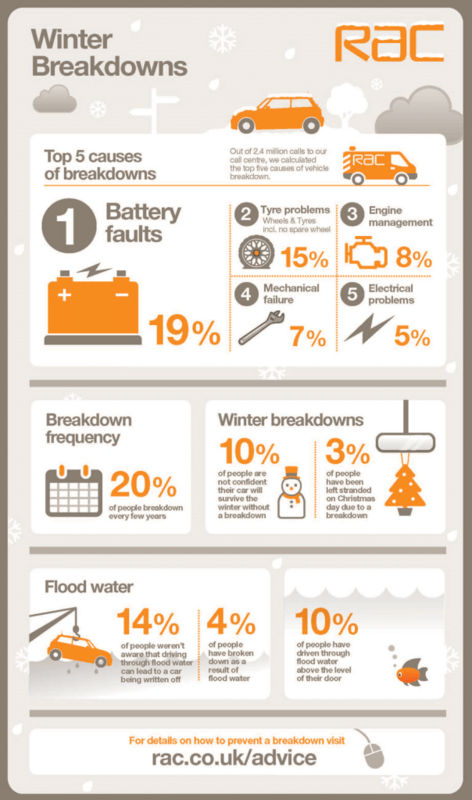 This infographic is showing the main causes of winter car breakdowns by the RAC Breakdown Service. 2. Jump start (flat battery). 3. Dead battery (replacement required). 6. No fault found (driver error). 10. Interior lights left on (causes a flat battery). If you call out your breakdown service for a problem with a tyre you need a serviceable spare tyre and the key for removing any locking wheel nuts. All cars have the potential to break down at some time and eventually most do they also have this inbuilt ability to choose the worst time and place to do so. Don’t be caught out there is no need to suffer the stress of being on your own if your car does break down. The standard cover of a Roadside Rescue breakdown cover is all you need to get help when needed.